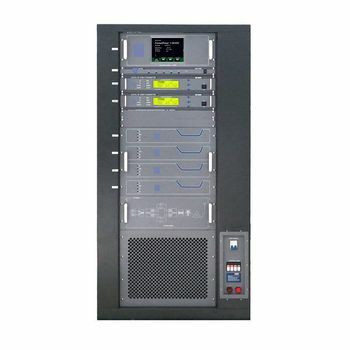 Innovative FM broadcast transmitter for radio stations,hot-plug amplifier module and double digital exciters,automatically change.Output power is stable with AGC fuction. This 5KW FM transmitter is an excellent FM stereo transmitter for professional radio station.It is reliable and high performance.It consists of center control module,double digital exciters,6 pcs hot-plug 1KW FM amplifer modules,6-way combiner,a perfect BPF and 5 pcs hotplug 2500VA switched power source modules. 1. Six units 1KW hotplug RF power modules.Total output power is extremely stable thanks to AGC(Automatic Gain Control). 2. Five units 2500VA hotplug switched power supply units are working in parallel. 3. 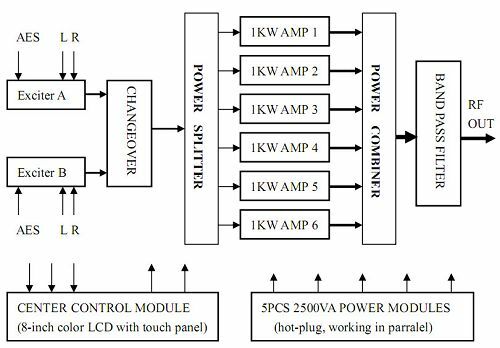 6-way High efficiency power combiner with patent technology. 4. Two All-digital 10W exciters(DSP+DDS) with automatical changeover switch. 6. 8-inch Color LCD with touch panel displys all the parameters in real time. 7. Intelligent protect fucntions by centre control unit,like over Pf,over SWR,over Temp,Over V,Over I.